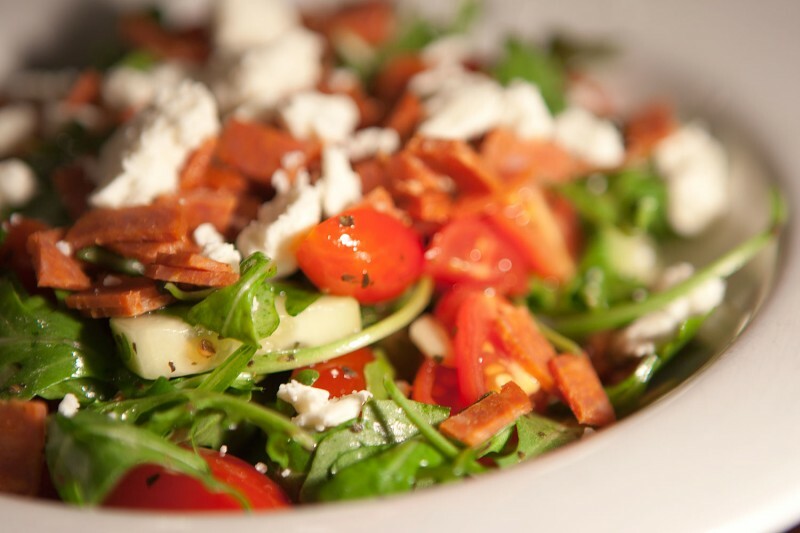 Rocket, otherwise known as arugula, makes an excellent green for a salad. 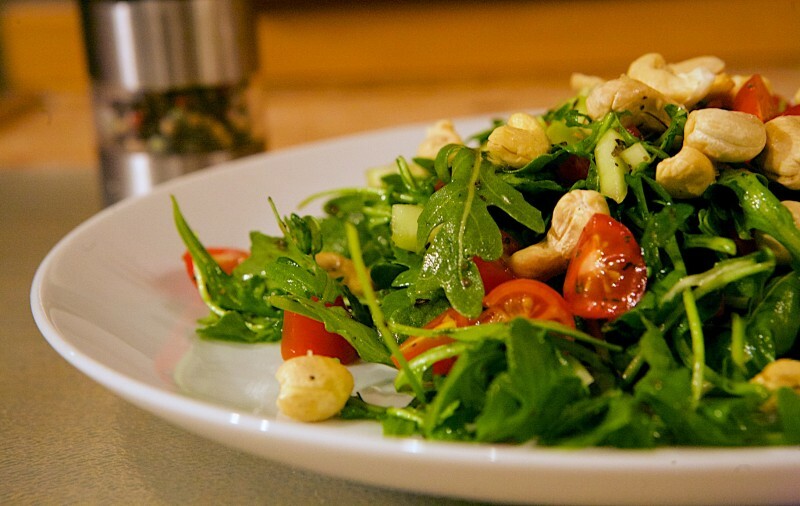 Rocket, otherwise known as arugula, makes a wonderful base green for a salad. 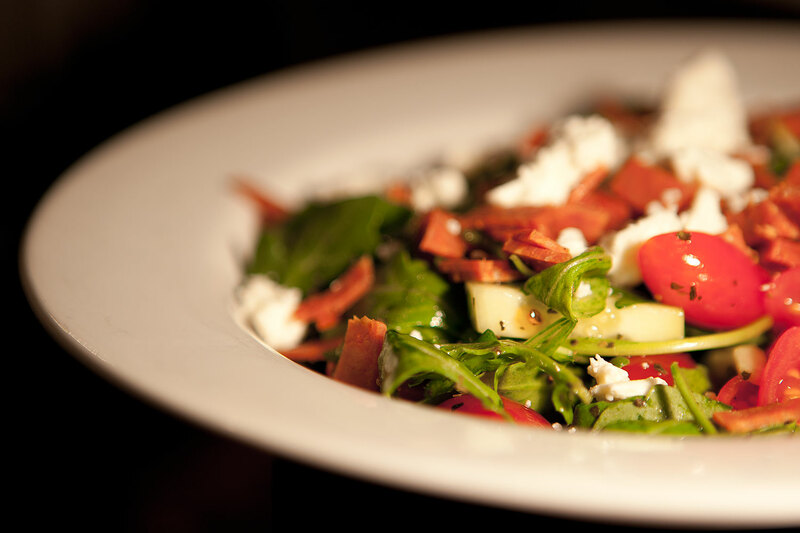 Some nights, a light and refreshing supper is what’s on order and there’s nothing better to satiate that need like a rocket salad. Arugula is known outside of the United States as “rocket” or eruca sativa, and is a bitter leafy green. To combat the bitterness, the salad dressing I made for this uses lemon, sugar and balsamic vinegar and I think it’s pretty wonderful. To bring out a few more flavors in this dish, I added some uncured pepperoni and feta cheese, though it can be made without for people who suffer food allergies like dairy and garlic. I preheated the oven to 325°F. I started by taking a bag of unsalted raw cashews (Trader Joe’s is always a good bet for these), placing them in a bowl with some olive oil and a little salt. Mix until the oil coats the nuts, and then place on a baking sheet and put in the oven for 10 minutes. While the nuts are roasting, it’s time to make the salad dressing. For this, mix a bit of olive oil with the juice from half a lemon (2:1 olive oil:lemon ratio). Add a tablespoon of dried basil, some salt, a teaspoon of good balsamic vinegar, and a half-teaspoon of sugar. Mix this, and let it sit. Combine arugula (I used half a bag), cherry tomatoes, diced cucumbers, and diced pepperoni. Add this to the dressing and mix until the leaves of the arugula are coated. At this point, you should have taken the cashews out of the oven, and can serve up the salad and garnish with the roasted nuts and feta cheese crumbles. I like to add a lot of cracked black pepper to top it off.